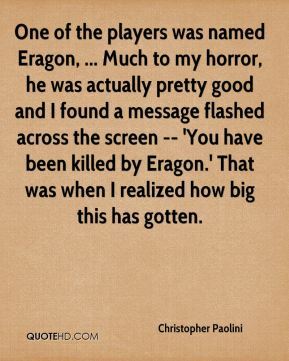 One of the players was named Eragon, ... Much to my horror, he was actually pretty good and I found a message flashed across the screen -- 'You have been killed by Eragon.' That was when I realized how big this has gotten. 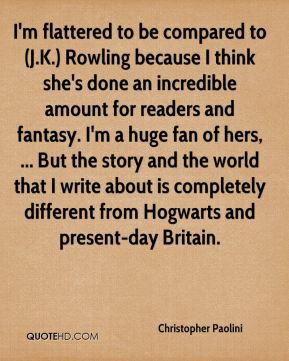 I'm flattered to be compared to (J.K.) Rowling because I think she's done an incredible amount for readers and fantasy. I'm a huge fan of hers, ... But the story and the world that I write about is completely different from Hogwarts and present-day Britain. 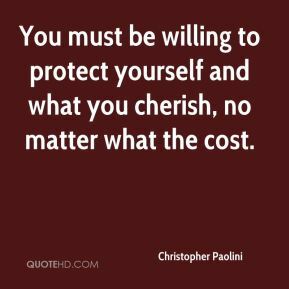 You must be willing to protect yourself and what you cherish, no matter what the cost. I didn't have a lot to do. 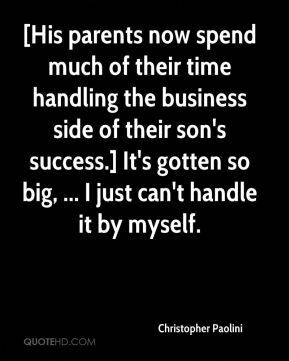 Dad felt I was too young to go to college; I didn't have a job, and the nearest town was some 20 miles away. I needed a way of entertaining myself. Writing was what I settled on. 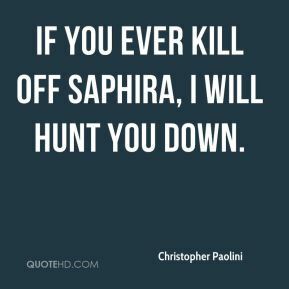 If you ever kill off Saphira, I will hunt you down. And what I hoped, and what I still hope, is that within those familiar elements I'm able to provide a unique twist. 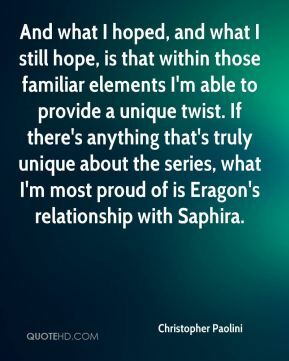 If there's anything that's truly unique about the series, what I'm most proud of is Eragon's relationship with Saphira. Eragon started as me but ended up evolving into his very own character, ... Even as he has gone through his coming-of-age story, the process of writing and publishing these novels has been my own coming-of-age story. 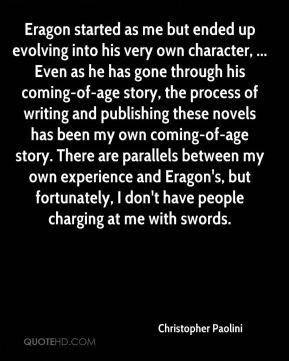 There are parallels between my own experience and Eragon's, but fortunately, I don't have people charging at me with swords. 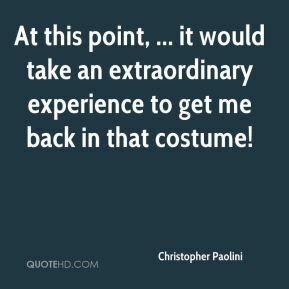 At this point, ... it would take an extraordinary experience to get me back in that costume! 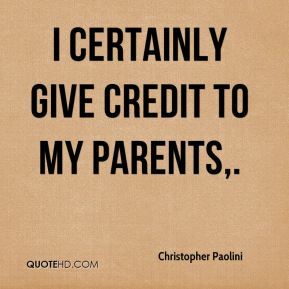 I certainly give credit to my parents. I like to think that he possesses my better traits, ... 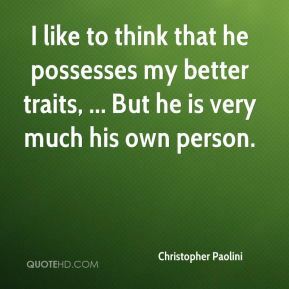 But he is very much his own person. 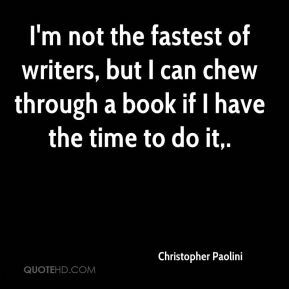 I'm not the fastest of writers, but I can chew through a book if I have the time to do it. 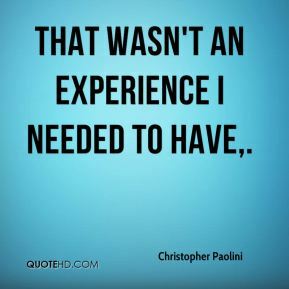 That wasn't an experience I needed to have. 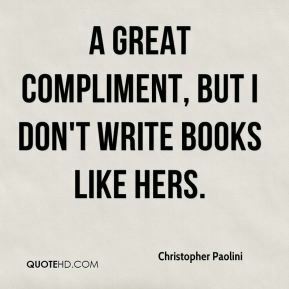 a great compliment, but I don't write books like hers. 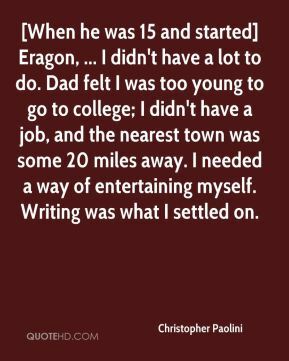 [When he was 15 and started] Eragon, ... I didn't have a lot to do. 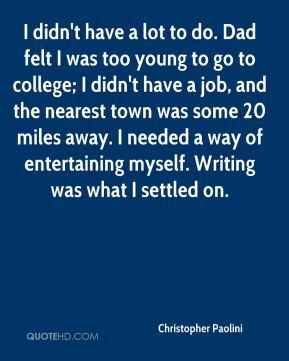 Dad felt I was too young to go to college; I didn't have a job, and the nearest town was some 20 miles away. I needed a way of entertaining myself. Writing was what I settled on. 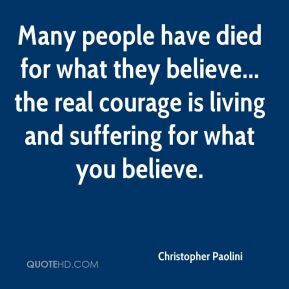 Many people have died for what they believe... the real courage is living and suffering for what you believe. I've never gone to a regular school. 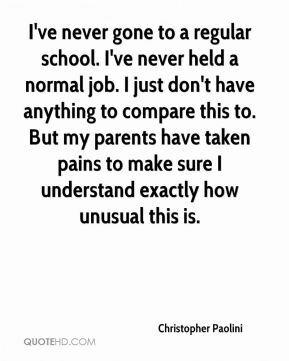 I've never held a normal job. I just don't have anything to compare this to. But my parents have taken pains to make sure I understand exactly how unusual this is. 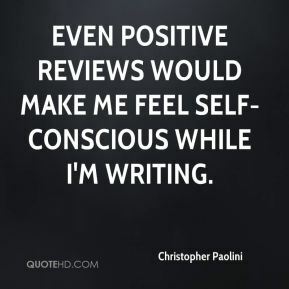 Even positive reviews would make me feel self-conscious while I'm writing. My editor and I are in a polite argument over that, ... 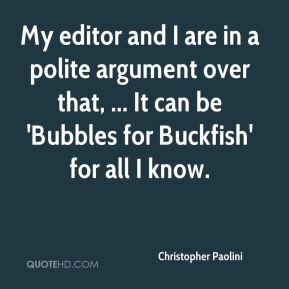 It can be 'Bubbles for Buckfish' for all I know. It's obviously enormously gratifying, and I'm enormously grateful that so many people have enjoyed the story. This sort of attention . . . I don't think it's something that would be normal (to deal with) at any age. 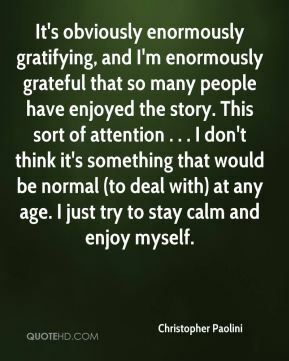 I just try to stay calm and enjoy myself.